Picture this: You’re thumbing through the mail and find an invitation to a 1-year-old’s birthday! It’s little Johnny’s first birthday and you are invited! You check the calendar and everything looks great to be able to attend . . . now what do you buy for a 1-year-old gift? 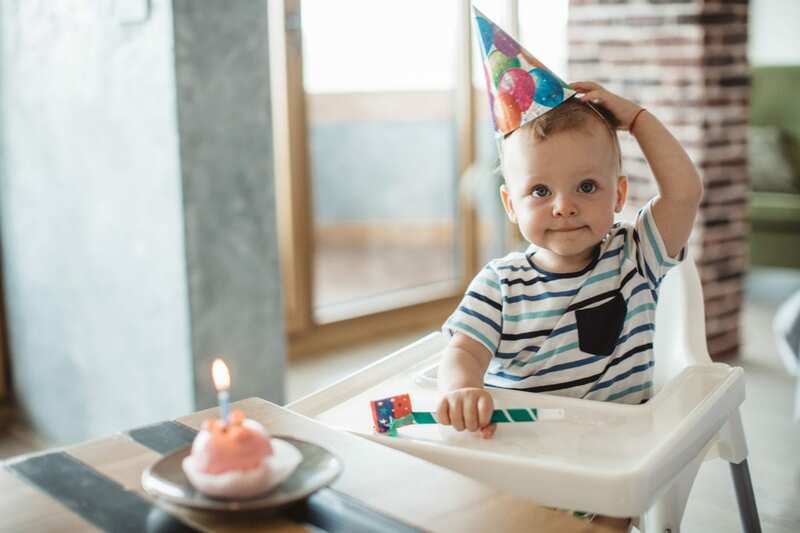 We’ve all been there with a birthday invite and then completely blank on unique gift ideas, whether it has been a minute since you’ve had a 1-year-old, you don’t have any children of your own, or you just need some fresh ideas: I am here to help! What Makes for an Age Appropriate 1-Year-Old Birthday Gift? Before I give you a list of options for gifts for a 1-year-old’s birthday party, it might be helpful if you know what types of milestones a 1-year-old should be hitting and then decide on a toy that will be helpful to their development, but also fun! By one year of age a child will start to enjoy the experience of having a parent or other adult play with their toys, with them. They may start to bring you things to play with such as cars, baby dolls, or the beloved play phone (“ring ring”–everyone answers the phone no matter what!). Story books with bright pictures, interesting characters or the “touch and feel” books are a great idea to keep the child interested all the way through. One year olds enjoy peek-a-boo and patty cake and there are plenty of toy options that sing or play games with them. Cognitive development is really starting to take off at this age, as well. Cognitive development is the thought process of remembering, problem solving, and decision making. They want to explore more on their own and learn every little thing about what they are playing with, such as what happens when you throw, bang, or shake the object. Handheld toys that are easy to grasp are perfect for practicing these skills! Around this time too they are probably on the move or very close! Toy walkers or ride on toys are awesome for helping their motor skills develop. Playing pretend is also fun for young toddlers. Toys that facilitate pretend play include: dolls, pets with pet carriers, doctor kit, camping sets, kitchens, shopping carts, play food, and playhouses. All of the things that mimic what they see mom or dad doing everyday are things they want to play with. Like playing with remotes, phones, laptops, and tablets. Lots of these toys have lessons built into them with songs and music to teach kids colors, numbers, shapes, and letters. To go a step further with these ideas, pick something up to keep your chosen gift organized. When my boys get play dough I love when it comes in a bin I can throw it all into when they are done that way it’s all away and on the shelf and when they want it again I can just go grab one bin. They received a set of puzzles one year and it came with a stand so that after they were done we could slide each puzzle into the slot and put it up on the shelf and everything was together. Bath toys that have a net to go in after bath time is helpful to keep the clutter from becoming overwhelming in our small bathroom. If parents are opting for no gifts or more of an “experience” based gift, passes to the zoo, a local water park or splash pad, Legoland, or local indoor play park would be fun and something the whole family could enjoy later. Ask the parents about any upcoming vacations or classes they are taking and help either with the fee or equipment that’s needed, such as if they are going to be taking a swim class you could get them a new swimsuit or cute towel and a wet bag to throw their wet clothes in after class. It is helpful to the parents and fun to know you played a part in an activity they love. A fun gift option that is more for the parents is offering a couple nights a year of volunteering for child care. You could wrap up cute coupons or just a calendar marked with “date nights” written in, anytime free child care is an option with people we love and trust makes for a much more enjoyable date night and the trade off of hanging out with a sweet little one isn’t so bad either. Whether you opt for a traditional toy or a not so traditional “experience” gift or just the gift of your time, I hope some of these ideas sparked something new for you and leaves you feeling excited to attend this birthday party with confidence in the choice you picked!